please enter the number on the back of your Club card. (the number under the bar code). please enter the same zip code you provided when you purchased your Club card in-store. It may take up to 48 hours to update the website with the information provided in-store. 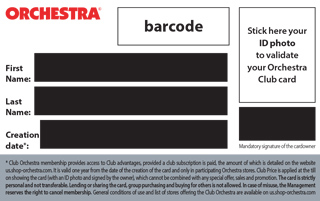 Please let us know a bit about yourself and your family, so we can get to know you better and make sure you enjoy the full benefits of the Club Orchestra.